The UK will vote Thursday on whether to leave the European Union in a so-called Brexit. Polls show the Leave and Remain camps in a dead heat, although the two newest results show the latter slightly ahead. If the Brits vote in favour of leaving, the consequences for investors could be severe: HSBC’s chief economist Simon Wells argued that the near-term economic risks and market impact could include an immediate 15% drop in the pound against the dollar, a fall for the euro as well, and a global move to “risk-off,” meaning investors sell stocks in favour of the perceived security of bonds. However, even if the Brits vote to stay, both the UK and Europe could be looking at a rocky couple of months amid ongoing large-scale economic and political challenges such as the migrant crisis, the Turkey-EU refugee deal, and the seemingly endless drama in Greece. “A UK vote to leave the EU would clearly cause protracted political uncertainty for the UK and for Europe more broadly. But a vote to remain – which remains our base case – might still leave us with a deeply divided nation, divisive UK politics, and a hesitant European Union. Another example, which many people might have missed given the anxiety surrounding the Brexit vote, is that the eurosceptic, anti-establishment Five Star Movement was the big winner in Italy’s recent municipal elections. Most notably, Five Star’s candidate for mayor of Rome Virginia Raggi won 67% of the vote, which is more than twice the vote share the mainstream center-left Democratic Party (PD) candidate got. And Europe has a bunch of other elections coming up. Days after the Brexit vote, the Spanish will head to vote again after elections in December failed to produce a government. And over the next year, the Netherlands, France, and Germany — three major countries where far-right populist parties are growing in popularity — will all have elections, too. 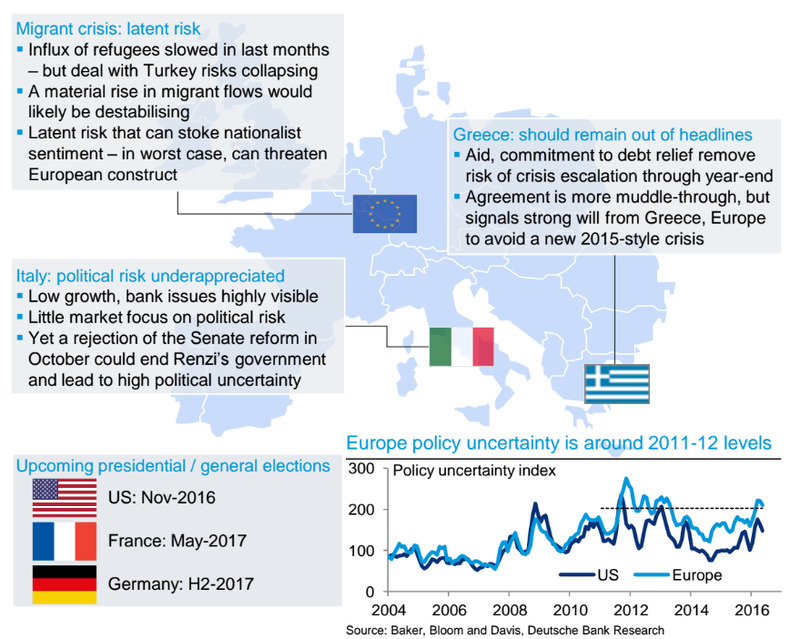 Some analysts argue we could be looking at continued political uncertainty and limited coordination in Europe in the longer run. 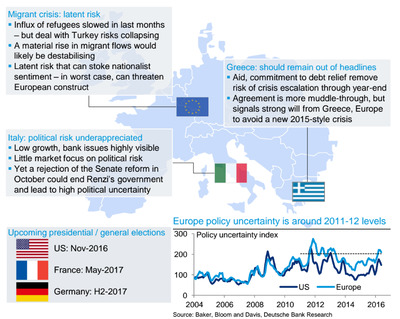 “Beyond the immediate risk events of the Brexit referendum and Spain election, geopolitical agenda remains in focus,” wrote a Deutsche Bank research team in a note to clients, highlighting the upcoming elections, as well as the migrant crisis and Greece. 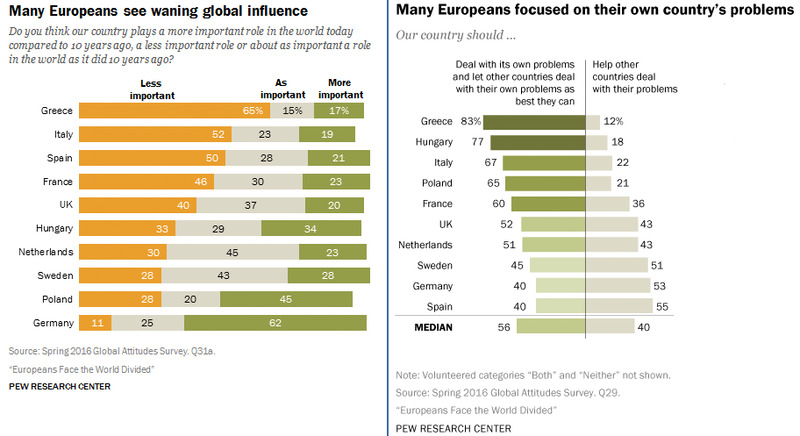 Notably, these political tensions in Europe and the rise of populist parties seem to be at least partially correlated with citizens’ perceptions of their country’s importance on the global stage and economic stresses. 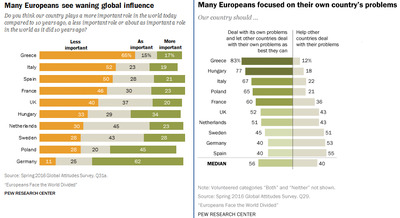 Regarding the first point, there appears to be a correlation between Europeans who think their country should turn more inward and nationalistic and those who believe their nation’s influence has declined over the last ten years, according to data collected by Pew Research. More respondents from Greece (65%), Italy (52%), France (46%), and the UK (40%) seemed to think that their nation plays a less important role in the world today than it did 10 years ago, rather than a more important role. Respondents from these countries were also highly likely to say that their nation should deal with its own problems and let other countries deal with their own problems as best they can – with Greece at 83%, Italy at 67%, France at 60%, and the UK at 52%. Relatedly, the Economist recently shared a chart comparing the percentage of native and foreign born people aged 15 or older with tertiary, or college-level, education in various OECD countries. The data are from 2011, but it’s notable that members of Britain’s foreign-born population were more likely to have a tertiary education, which — excluding any prejudices employers might have towards migrants — suggests that less-educated native-born Brits might get bumped out of better jobs. And, for what it’s worth, this type of situation can create a breeding ground for an “us versus them” mindset, adding to a country’s political tensions and strife. Another interesting case is Finland. The Northern European country is already one of the most developed, wealthiest in terms of GDP per capita, and least corrupt countries in the world. However, its economic outlook is pretty muggy as it struggles with the collapse of Nokia, a dying paper industry, weak demographics, and its inability to adjust monetary policy to its specific needs because of its adoption of the euro. And so, although its economy won’t collapse in on itself — and it’s certainly not in a complete shambles like, say, Syria — peoples’ living standards might not tremendously improve in the near future, and that could have implications for the eurosceptic movement going forward. “Stagnating improvements to living standards will continue boosting a growing eurosceptic movement in Finland, even if an exit from the currency union is highly unlikely at any stage over the next decade,” Michael Richards of BMI Research argued in a recent report. In sum, the political discontent surrounding the Brexit vote is not limited to the UK. Rather, it’s a trend that’s starting to bubble across the EU amid ongoing real and perceived economic and political stresses. And it doesn’t seem like something that’s going away anytime soon.